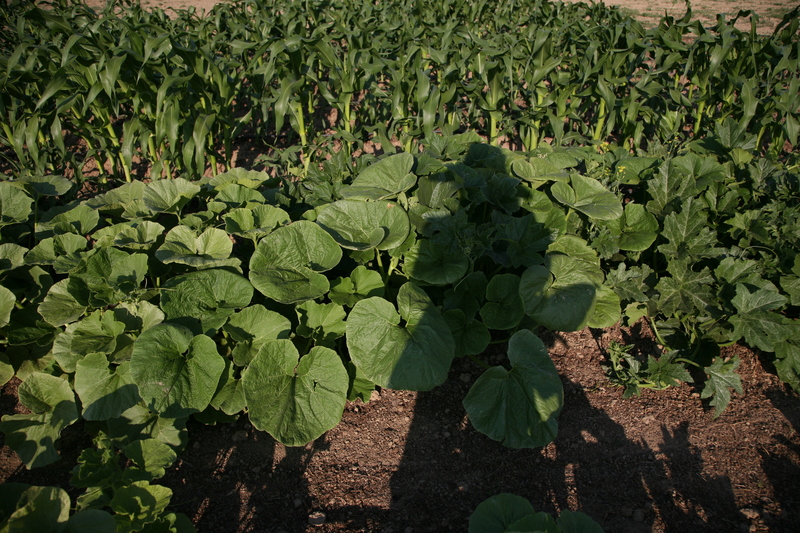 Anyway, our squash continue to die: the ones that were wilting are now flat-lined into the soil. A post-mortem conducted on the dead ones, along with some vivisection conducted on those still living, revealed no oozy fluid associated with bacterial wilt. Nor could we find any vine borers, or evidence of vine borer entrance holes at the base of the plant (which were depicted in one of our organic gardening books). Curioser and curioser, as Alice said. We ran through other possible culprits: too much water? Poor soil? But only a few plants are afflicted, and the whole block is being watered the same amount–besides, the death seems too sudden to be a water issue. (Ditto for the soil — it’s pretty even throughout the field, and wouldn’t plants show more evidence of a slow decline?) A disease not mentioned by any of our 5 books on organic gardening? We noticed a lot of different bugs on the dead plants, including some small white ones on the roots. But we didn’t read about any squash root-mites, and I wouldn’t exactly describe any of the bugs we saw as a major infestation. What else could the mystery death be? Hmm. For now, we can only wait and see.